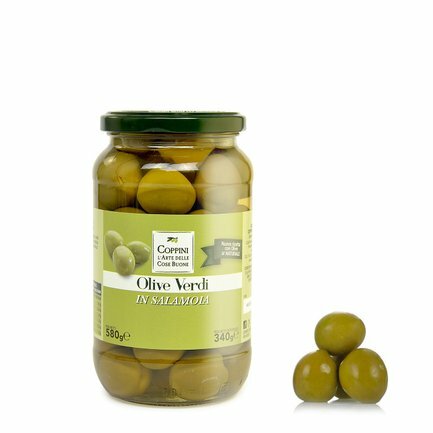 The green olives in brine from Coppini are made with cultivar Nocellara. The company processes them using a particular technique that maintains their crispiness, so the pulp of this olive remains firm so you can appreciate its full intensity. Try it as an aperitif, to fully appreciate its flavour, or add it to light white meat and vegetable dishes. Ingredients Green olives, water, salt. Acidifier: lactic acid. Antioxidant: -l-ascorbic acid. Allergens: none. For more information on product labels, please contact our Customer Service department. The information on the labels of the products may vary for reasons beyond our control, therefore, there may be discrepancies between the information on the site and that on the products delivered. Please always check the information on the product before consumption or use. Since 1946 Coppini arte olearia has been dedicated to producing high quality olive oil. Three generations who cultivate with passion, produce oil and spread their love for this true green gold. In addition to this high-quality olive oil, they also make olive oil based products, with an intense and full flavour.